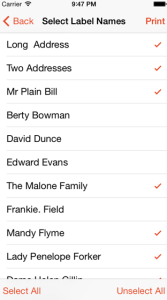 To print the names and addresses to address labels, display the list of names and tap the Print button at the bottom-right. Next – tap on Address Labels on the popup box. You then get the chance to select some or all of the names to be printed to labels. 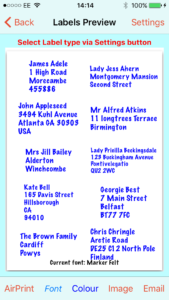 The table displayed will show which name/addresses will get printed – those with the Check-marks. When first presented, names that have already been marked as having been mailed, or as an eCard, will not have the checkmark. To add a name to the list to be printed, tap on the name. 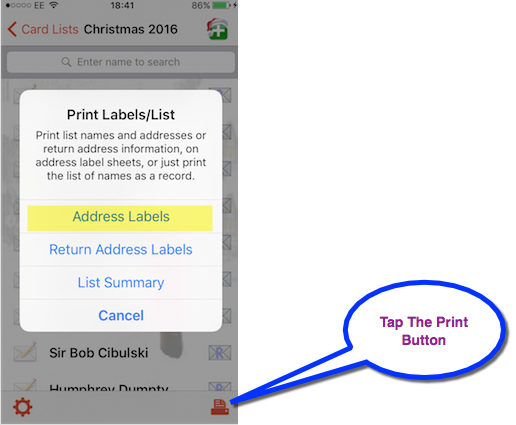 For convenience, you can mark all names for printing by tapping the Select All button, and then, if desired, tap those names you do not require a label for. Similarly, you can tap the Unselect All button to remove all of the check marks, and then tap the names you do want labels for. 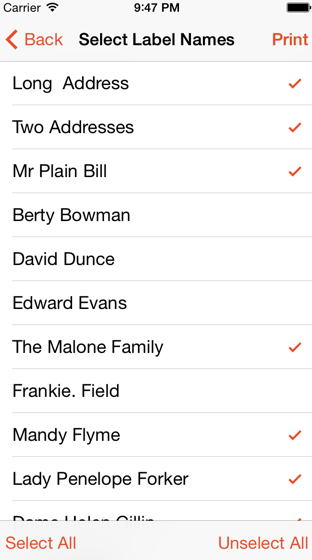 When you have checked the desired name, tap the Print button on the top right. You will then see a preview of the Label sheet. 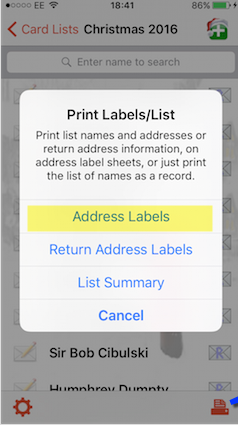 Before printing, especially the first time, you must tell the app which type of address sheet you are using. This can be achieved by tapping the Settings button on the top right. You can also change the color and font via the buttons on the bottom tool bar. To print directly, tap the AirPrint button. You then just select the printer and hit the print button. Note: even if you don’t have an AirPrint printer, it might still be possible to print via AirPrint! For example, if you have a non-airprint printer connected to your network, and you use a mac, you can buy an app for the mac called Printopia, which will allow you to use the printer as an air printer. There might be other ways of doing this, and possibly free, but Printopia is not very expensive and is known to work well. For a Windows PC, there are possibly similar solutions. Fingerprint might work in this regards. If it is not possible to AirPrint, you can email the list and print from a mac or PC. From the preview screen, tap the Email button, and select the email address; then send. The address list will be sent as a pdf file attachment. Please note that the addresses will be positioned central to each label. Since the addresses will be of different lengths, they will not appear to line up, when viewing the pdf file. This does not matter, but has confused some users who thought there was a problem with the layout. As long as each address is displayed in the correct position for an individual label. then all is fine. 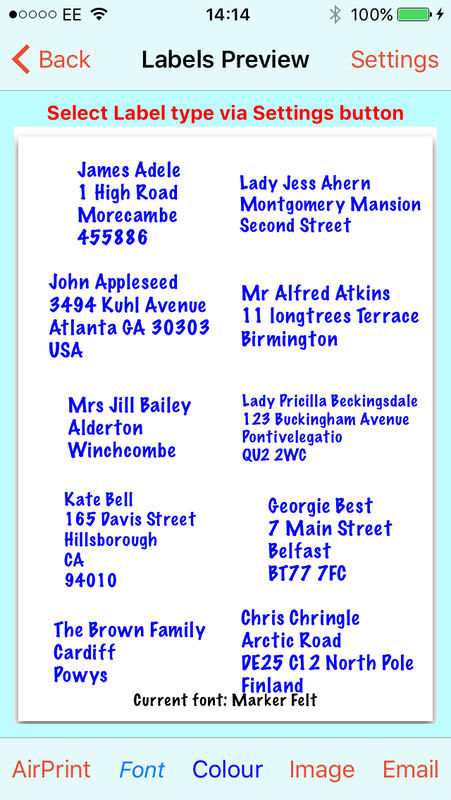 Some users have had problems when printing their labels, finding that the addresses did not line up with the labels. In all cases reported so far, this has been due to a problem with the mac or PC program used to print the pdf file. It is essential that the program used prints the pdf file exactly as it shows on the screen. If the settings are wrong, the computer program might add margins, or scale the output such that the original dimensions are lost. The setting must print actual sixes with no scaling (or scaling set to 100%). For more information, please read the printer settings page.